Water is an indispensable part of our daily diet. It is a chemical component that makes up about 70% of our total body weight. It is also a component that is very easily taken for granted. Staying well hydrated is one of our body’s basic needs. In fact, for people who perform rigorous workouts and play a sport, optimum hydration is a must. Thirst is a late indicator of dehydration; when thirsty, our body is already dehydrated at cellular level. The color of the urine can also determine our hydration status. Dark yellow urine indicates dehydration whereas clear urine indicates a well-hydrated body. Along with the diet, we must also pay attention to what and how much water we drink. But, why is it so important? Pre-workout water intake: If we start our workout in a dehydrated state, it will adversely affect our performance. We would feel low on energy, stiff muscles and also get cramped easily. That is essential because water forms a major part of our muscles and also helps in keeping the joints well lubricated. The water intake must start well 2 to 3 hours before a workout or any sporting activity. The water intake also depends upon the intensity of activity and the individual’s own body condition. If a person sweats too much or works out in scorching heat, he must have at least 500-600 ml of water 2-3 hours prior to exercise. This will ensure good hydration status. If the workout lasts for a longer time, like over an hour, then it would be advisable to consume a carbohydrate drink (up to 8% concentration). This will help to prevent fatigue and dehydration. Water intake during workout: The consumption here depends on the duration of the activity. If the exercise or sports event lasts for less than an hour, then there won’t be a chance to ingest too much fluid within the duration of the activity. Here, we can consume 1 small glass (180-200 ml) of plain cold water every 15-20 minutes. Cold water would make a better choice over water at room temperature because cold water has a faster gastric emptying time. Also, if the person has consumed enough dietary carbohydrates, the glycogen stores in his muscles and liver will suffice for providing energy to sustain the activity. In the case of a high-intensity workout or sports event (marathon, a game of football, etc) that goes for over 1 hour, the individual is at a risk of decreased performance due to dehydration, fatigue and hypoglycemia. Their fluid intake must include carbohydrates and electrolytes. Carbohydrate will prevent hypoglycemia. The electrolytes like sodium and chloride need to be replenished due to sweating. Also, sodium will help in water retention. Post-workout water intake: After exercise or any sports event, we need to pay good attention to eating and drinking right. There arises a need to replenish the carbohydrates, salts and water that are lost during the activity. Immediately after the exercise/event, for the next few hours work on improving your hydration status. 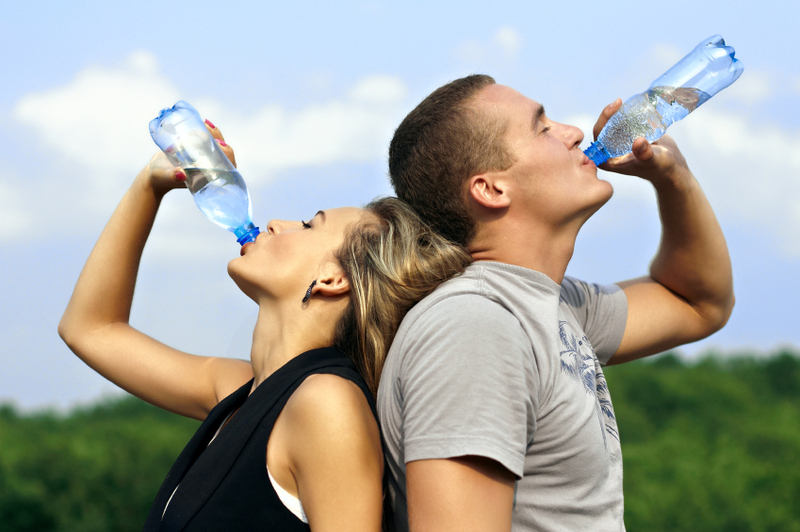 Do not start with any new activity without attaining good hydration levels. Replenishing the salt reserves must be your top priority as sodium has good fluid retention capacity which keeps up the urge to drink water. Fluid consumption, containing carbohydrates, salts and water, must continue up to 5-6 hours after the activity. The best way to ensure that you are hydrating yourself well is, to weigh yourself before and after the exercise/event and drink at least 400-500 ml of water for every 1 pound lost. Fluid intake needs to be planned and distributed at regular intervals. It would always be better to carry a bottle of water with you wherever you go and sip on it regularly. Many times, your performance in workouts and sports can be improved only with optimum hydration. Lastly, whatever may be your goals, remember to consult a sports nutritionist about it. A post graduate in Marine Zoology and armed with additional degrees in a Personal Trainer Course and Sports Nutrition from K11 Fitness Academy, Anushree Ashtekar has worked as a Gym Instructor and Personal Fitness Trainer at Cuts n Curves Gym. She helped her clients to achieve goals such as Fat Loss, Muscle Gain and consulting them on their nutrition. She has also consulted clients suffering from health problems such as Hypertension, Hypothyroidism, Diabetes, PCOS and Obesity. She firmly believes that “If you take care of your body, your body will take care of you” and to achieve this you need to have a good mind, body and soul coordination. Her own fitness regime consists of Weight Training and Cardio Vascular programme. She de-stresses by way of reading, cooking, listening to Music and going on Nature Trails. She says she leads a fit and healthy lifestyle and loves to help people do the same.